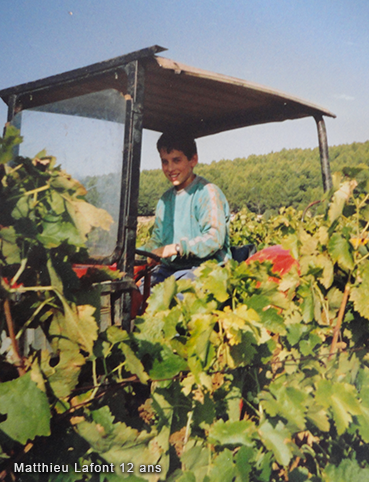 Although he grew up at Pomples to the rhythms of the property’s grape pickings, Matthieu Lafont did not intend to be a wine grower at first. After he got his diploma as an electro-technique engineer in 2005, he worked for several years in this area. He felt nostalgia for the Property, though. Therefore, when it was announced that the crops’ supervisor, a conscientious and skilful man, would leave in 2009 after 32 years spent at the Property, Matthieu quit his job. Then, in 2008 he undertook to study wine growing and oenology at the Lycée Agricole in Hyères and prepared the BPREA (Brevet professionnel de responsable d’exploitation agricole) thus adding theory to his practices. He passed the next year and entered the family property to which he brought a new trend between tradition and modernity.